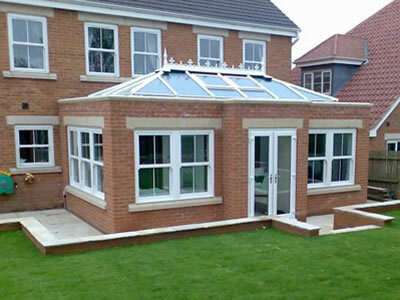 Why Are Orangeries becoming so popular? ItÃƒÂ¢Ã¢â€šÂ¬Ã¢â€žÂ¢s a good question, the orangery harks back to around the 18th century, a building reserved for housing citrus trees and exotic plants. Typically, orangeries were associated with larger residencies and regarded as a status symbol. In modern times the orangery is an alternative to a conservatory, offering a design of building more akin to an extension but with more windows and a lantern glass ceiling flooding the room with light. So, a more substantial building than a conservatory but not as big a project as an extension, could be one reason why orangeries are getting more popular. Google Trends shows that more of us in the UK are searching for orangeries each year since 2010. The versatility of an orangery is perhaps, the key driver behind the growing demand. As lifestyles change and families grow, additional multi-purpose space is a welcome addition to the home, a light airy home office by day and by night, a generation engaging with different devices at the same time in one household, well, the orangery is a perfect sanctuary away from the TV to read a good book, on a tablet of course. Bespoke Design ÃƒÂ¢Ã¢â€šÂ¬Ã¢â‚¬Å“ Create a multi-purpose room that suit your requirements now and in the future. Energy Efficiency ÃƒÂ¢Ã¢â€šÂ¬Ã¢â‚¬Å“ Modern orangeries are fitted with A rated double glazing windows and the lantern roofs have eco glass that deflects heat back into the room but the outer pain reflects heat from the maintaining a comfortable temperature in the summer. Interior Design ÃƒÂ¢Ã¢â€šÂ¬Ã¢â‚¬Å“ Typically an orangery will have more wall space and some ceiling area providing the opportunity to be creative with lighting and decoration. Style ÃƒÂ¢Ã¢â€šÂ¬Ã¢â‚¬Å“ Your orangery can be matched to the style of your home with a choice of modern, contemporary or traditional designs that complement your property perfectly. Investment ÃƒÂ¢Ã¢â€šÂ¬Ã¢â‚¬Å“ As a more substantial building than a conservatory an orangery will typically add more value to your property for longer.